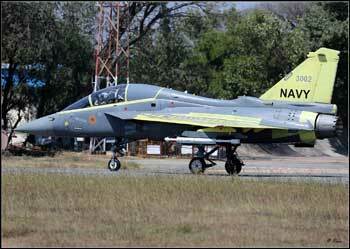 The first LCA Navy single-seat fighter prototype that made its debut flight yesterday, will join the existing carrier compatibility test schedule at INS Hansa, Goa from next month. The platform, designated NP2 took to the air just weeks after the first prototype, a twin-seat fighter trainer, made its first launch from the ski-jump at the shore-based test facility (SBTF). The NP2 is the last of the Mk.1 prototypes and together with NP1 will be the only platforms available for the Mk.1 programme towards operational clearance. The Indian Navy has been satisfied with the performance of the NP2 during its first flight, with preliminary data indicating that the aircraft exceeded expectations across several parameters. The next two prototypes, namely NP3 and NP4, will both be Mk.2 fighter variants that involve a multiplicity of improvements and enhancements. Team LCA-N will gradually look to expand the flight envelope of the NP1 and NP2 through a carefully planned series of manoeuvers from Goa. The Indian Navy, which funds 40% of the LCA-N programme, has already ordered six Mk.1 types and intends to procure at least 40 aircraft in total in a mix of variants, though it is of course keen on the Mk.2, powered by the GE F414 turbofan engine.